Spencer Finch is no stranger to the Kent coastal landscape. In 2011 the American artist hoisted 100 flags, all dyed with variants of sea colour, in Folkestone and installed a colour wheel on the seafront as part of Folkestone Triennial. 2014 sees a return of the artist, this time to Turner Contemporary in Margate, for a medium-sized solo exhibition, The Skies Can’t Keep Their Secret, and his first in the UK in the last five years. Turner Contemporary is currently celebrating a ‘Summer of Colour’ and the majority of the exhibition spaces are taken up with a look at the work of Piet Mondrian and his transition from landscape and figuration into abstraction. The gallery walls are painted grey and the spaces feel dark, rather serious. It’s clear that you’re there to look, to think about the looking. Heads down, exam begins. A relief then, to emerge from the warrens into the sea facing galleries and Spencer Finch, flooded with light. Natural light with its shifts and changes is the main focus for Finch’s exhibition. The centre of the gallery is taken up by a large suspended ‘cloud’, Passing Cloud (After Constable) 2014. 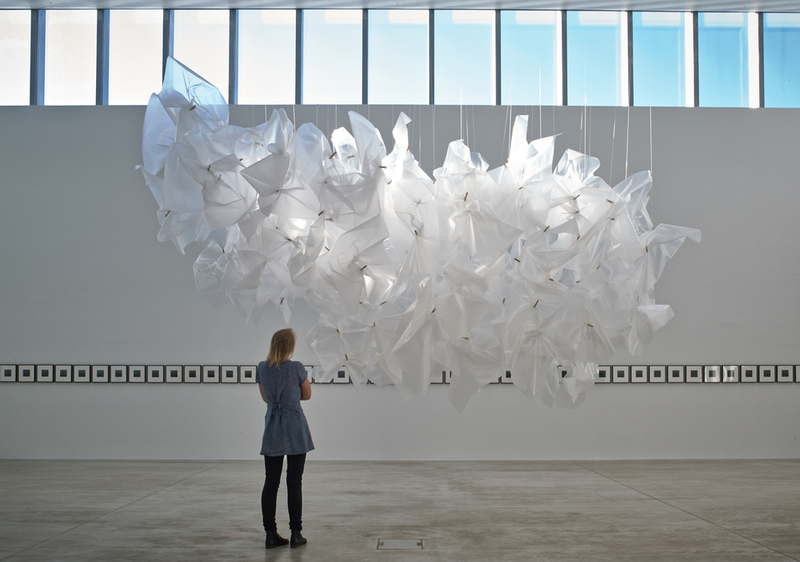 Made from ‘translucent filters’ but looking rather like the plastic sheeting you wrap paintings up in, the material is pinned together with wooden clothes pegs in an abstract cloudy bunch. The filters transparency alters with the changing light of the day apparently but unfortunately I did not witness anything during my brief visit. 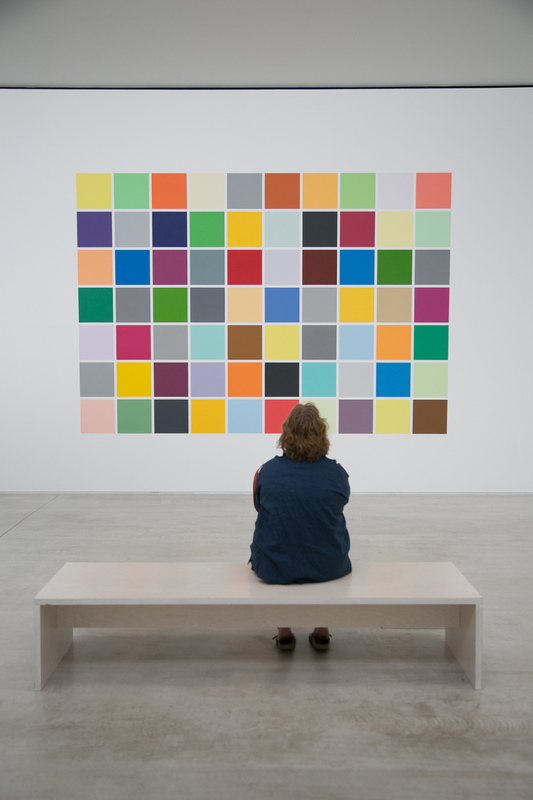 The same is true of another work Back to Kansas (2013) consisting of a grid of painted squares on the gallery walls. The size of the squares is scaled proportionally to the aspect ratio that the film, The Wizard of Oz, would have been projected and the colours replicate those from the technicolor scenes. As the light in the gallery fades as do the colours, turning the colour saturated squares to black and white. Again I did not stay long enough to witness this and I imagine the stewards in the gallery are the only ones really witnessing the works true effects. Lucky them. No wonder they kept asking visitors ‘Are you enjoying the art?’ for they, perhaps not the visitor, were getting the true durational effect. Two series of paper works are hung on the smaller opposite and adjacent walls, Wave Studies (2014) which has white tape on white paper producing an almost invisible pattern and Sunlight on an Empty Room (2014) which barely perceptible watercolour marks are made on white paper. These along with Atlantic Ocean (Coney Island), 2014, an LED light-box with a Fuji transfer of colourful wavy shapes, are largely forgettable. The work that lines the large back wall of the gallery, however, is not. Thank You Fog (2009) consists of 60 archival inkjet photographs roughly 11” x 11” arranged in a one line series at head height. If you begin at the beginning, the photographs appear just black squares. As you progress and peer into them, something, somewhere, starts to emerge. A verdant forest seen from its canopy or perhaps just within its boundaries. The effect, as you move along has some magic to it, a little like a view-master souvenir clicking through its slides to reveal, at the end, the forest landscape previously obscured by fog in Sonoma County. This work is the delight of the exhibition and, playing at rich art dealer, actually inspired me to request the pricing details from his Chicago Gallery. A very nice email informed me, several days later, that it would cost $65,000 but I had to politely decline. I just don't think it would fit in with the decor of our Margate flat. That is the only reason of course.